Alstone, a leading manufacturer of superior quality panel products like ACP, WPC nd decorative panel OLIGO, now introducing a revolutionary product which is 101% water proof and termite proof panel. It is manufactured with high quality wood polymer composites which is naturally Termite and Water proof. Not any treatment is required to make it safe against termite and borer like other wood base panels. ALSTONE PLY has a high dimensional stability and it does not warp in changing weather. ALSTONE PLY comes with Life Time Guarantee which is first in India for giving such Guarantee it is manufactured with virgin materials and utmost care is taken during its manufacturing to avoid the any quality related problem. ALSTONE PLY is completely free from any toxic emission, it emits 0% formaldehyde as per E1 standards. It is also fire retardant panel and it is perfect replacement of PLYWOOD and MDF or HDF board. Plywood is manufactured by pasting multiple layers with resin which get separated after excessive exposure to moisture or heat. 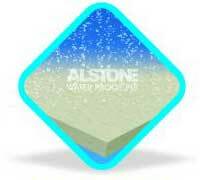 ALSTONE WATER PROOF ply is manufactured by single layer with water proof material in powder form. So there is no chance of de lamination. Resists water for a limited period: Since plywood is manufactured by wood veneers which are pasted with resin so there is always a chance for de-lamination of layers due to water. No effect of water for life time: Manufactured with single layers with wood polymer composites so it has capacity to remain in contact with water for life time. 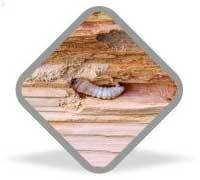 Favorite of Termite and Borer : Plywood gets destroyed by termite and borer after sometime. No one can give guarantee for termite proof plywood truly. 0% chance of Termite and Borer: Manufacture with wood polymer composite materials which is non favorite for termite and borer. Alstone WATERPROOF ply comes with life time guarantee against termite and borer. Chances of bending and twisting: Since plywood is manufactured with wood so it absorbs the moisture frorn atmosphere and gets bend and twisted after or before application. Zero chances of bending and twisting: Since ALSTONE WATER PROOF ply is manufactured by water proof material, WPC, so it does not absorb moisture even you can use it in swimming pool, it will remain as it is. 101% Termite and Borer Proof Ply. 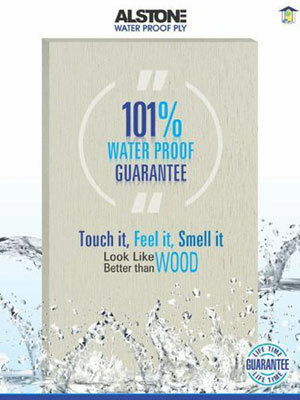 ALSTONE WATER PROOF PLY can be used just like other wood or Plywood. A carpenter can use the same carpentry tools as he use for any other wood panel to make furniture or in other wood working. Laminate or veneer can be pasted just you paste on other wood panels (Like Plywood). Carpenter can use nail and hammer to fix it anywhere he wants. The top surfaces of ALSTONE WATER PROOF PLY is just like wood face veneer in look as well as touch &feel. Any OEM/ carpenter can use his traditional tools or he can use panel saw, circular saw, EDGE BENDING MACHINES. ALSTONE WATER PROOF PLY is ideal for laser engraving and CNC routing. Carpenter will not feel any difference in working with ALSTONE WATER PROOF PLY except its strength which is incornparable wit any plywood. GIVE YOUR ALSTONE WATER PROOF PLY A DIFFERENT AND ELEGANT LOOK WITH PAINT OF YOUR CHOICE. This is an added advantage of ALSTONE WATER PROOF Ply to give rustic and elegant look to your interiors Er furniture. Use As Per Your Wish.